A delegation from Missoula’s sister city – Palmerston North, New Zealand – is visiting this week to learn more about Missoula and the ways in which the two cities can collaborate on tourism, economic development, education and cultural exchanges. 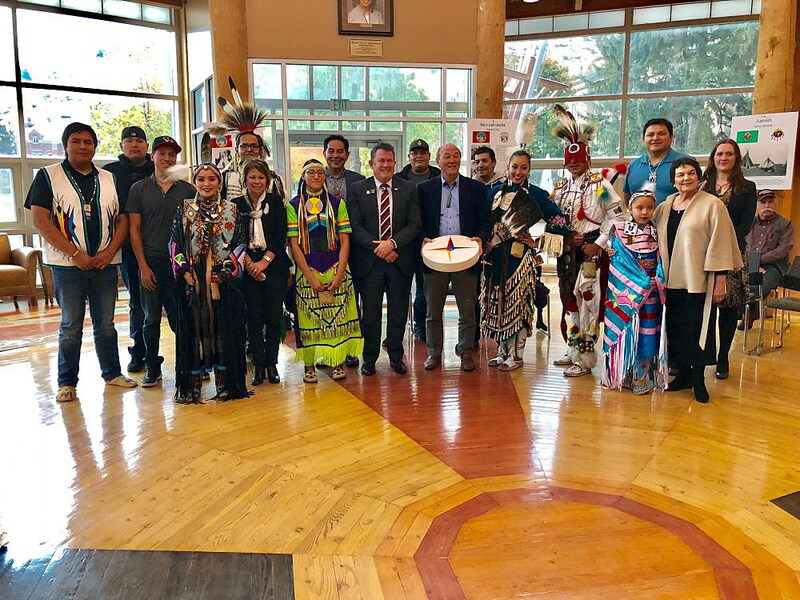 The delegation, which includes Palmerston North’s mayor, elders representing the Maori tribe, a Massey University professor and others, plans to visit the University of Montana and other colleges while exploring the Bitterroot Valley, the state’s capital, and meeting with city and state officials. Arts Missoula is hosting the delegation for the first time in eight years. Udo Fluck, Arts Missoula’s director of global and cultural affairs, hopes the cities’ connection can offer a better understanding between cultures and foster a flourishing relationship. “The more a person knows about the other, whatever the other may be, but outside of your own sort of cultural comfort zone is an important step to see the similarities and to not be afraid of the differences,” Fluck said. Sister city relationships are maintained primarily on a voluntary basis, as through Arts Missoula, but Missoula Mayor John Engen and Palmerston North Mayor Grant Smith welcome mutually beneficial relationships with open arms. “I think frankly, we have yet to realize some of the benefits of these relationships. They’ve largely been the product of volunteers trying their best year after year to maintain ties and I think Mayor Smith and I are interested in taking that a step further and finding ways to formalize exchanges,” Engen said. Adopting a city’s infrastructure knowledge and bettering future collaboration is the goal of sister city relations. Exploring other cultures and engaging in faculty and student exchanges between universities is another. For example, Palmerston North has invested in housing developments, and that’s something Mayor Engen said he hopes to achieve in the future. Exchanging best practices on emergency management, environmental sustainability, and city and business development are other focus areas. The delegation’s visit is the first step to an ongoing friendship, as well as a working relationship. “There’s a lot of stuff happening you don’t really know about until you start joining the dots,” Smith said. As of now, Smith said that a New Zealand farming company called LIC has been operating in Montana, offering farming advice and providing farming machinery and services to locals. Engen is open to setting up a trade office in New Zealand, a similar feat accomplished by Montana and its sister state, Japan. The office, located in Kumamoto, Japan, helps facilitate collaboration with each country on tourism, education, economic development and exports, Montana Department of Commerce communications manager Daniel Iverson said. The Palmerston North delegation plans to visit the Montana Department of Commerce to talk more about attracting people from New Zealand to Montana tourist landmarks and the best practices of the two cities, said Katie Willcockson, international trade officer with the Montana Department of Commerce. Smith hopes to learn more about indigenous cultures, higher education collaboration and how to trade with Montana in the future. New Zealand is familiar with expansive trade deals in the past with the U.S., China and Japan. “We’re a little island nation right on the other part of the world, and we have to trade. Otherwise, we don’t exist. It’s key to us getting out and seeing the world,” Smith said. 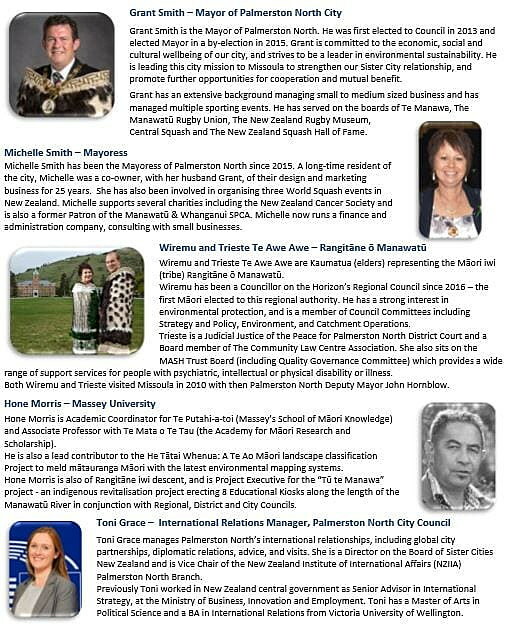 The sister city connection began in the early 1980s out of a prior collaboration between students and faculty from each city in research project conducted by Palmerston North’s Massey University and the University of Montana. Rugby, a major sport in New Zealand, was also a driving factor toward relations, Fluck said. On Saturday Oct. 13, the Missoula All Maggots Rugby Football Club (RFC), University of Montana Jesters RFC and Missoula Better Side RFC will celebrate New Zealand Day with a rugby game at 1:30 p.m.
A New Zealand film “Hip Hop-eration” will be showing at the Roxy Theater at 7 p.m. on Monday, Oct. 15.